As your enterprise adopts new technologies, your tech support and maintenance model grows exponentially, with dozens of original equipment manufacturers (OEMs) and third-party maintenance providers servicing their hardware and software products. The complexity of managing so many vendors within the four walls of the data center has become a logistical jungle. Even a few minutes of downtime can have a major impact on supply chains, productivity, finances and brand loyalty. Expert single-source support across your entire multivendor IT environment, helps reduce complexity, decrease costs and ensure availability. 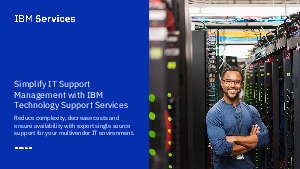 Download this eBook to learn more about simplifying IT support.